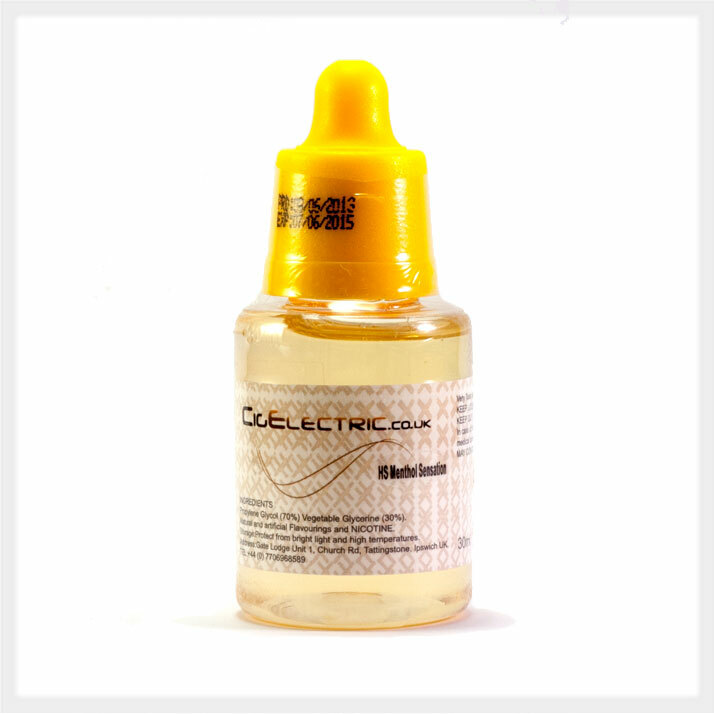 CigElectric’s delicious, top quality e-liquid. 30ml bottles with 24mg nicotine strength (yellow top). A range of tobaccos, menthols, fruits and drinks flavours! Enjoy our high strength 24mg E Liquid from the UK. 30 PG/ 70 VG mix. Labelled with production date and expiry. Available with 24mg, 18mg 12mg, 6mg and 0mg nicotine. All our e-liquids are tested and certificated by regulatory bodies including European MSGS,CE Certification and RoHS Certification. We only use pharmaceutical grade PG (Propylene Glycol) and all our e-liquids are supplied in child proof bottles and are CHIP compliant. Tobacco Blend is one of our most popular flavours. A classic tobacco taste, very smooth and mild. Perfect for all day use. USA Mix is a classic tobacco flavour based on Marlboro cigarettes. Smooth and rich similar to the full strength USA brand. Perfect for transitioning from tobacco cigarettes or enjoying that full smoky flavour. Gold&Sliver is a very popular classic tobacco flavour based on B&H cigarettes. RY4 is a popular tobacco flavour with hints of vanilla and caramel. Smooth and Mild. Perfect for all day use. Golden Tobacco (RY6) is a brand new edition to the Ruyan tobacco range. Probably the closest flavour to real tobacco. Oak smoked woody flavour with an amazing finish. You might be surprised its not real tobacco! Desert Ship is a strong, smoky tobacco flavour based on the popular Camel brand. USA Mix Mint is a very nice blend of the popular USA Mix flavour with the perfect amount of menthol to give that icy sensation and great throat hit. Menthol Sensation is a icy fresh flavour. Amazing throat hit and very enjoyable. If your a menthol lover this one is for you. Menthol Fresh and crisp, a great alternative to traditional tobacco flavours. Mint Refreshing and cool, a great variation on the menthol flavour. Spearmint Crisp and cool, just like your favourite chewing gum flavour. Another great menthol variation. Strawberry sweet and juicy ripe strawberry, perfect for a summer afternoon. Juicy Peach is a mouthwatering explosion! A delicious peachy punch full of citrus flavour, this one will leave you wanting more. balanced wonderfully with just the right sweetness. Fruit Mix is a tropical treat. A smooth blend of sweet fruit flavours. Banana, peach, watermelon and other flavours are pronounced and balanced wonderfully to create a fresh and enjoyable e-liquid. Blueberry is a very popular fruit flavour, bursting with blueberry taste. Coffee is a favourite for all those coffee lovers. A rich nutty roast flavour gives a great throat hit. Highly recommended! Vanilla smooth and creamy. Perfect for an all day alternative to Tobacco flavours. Irish Cream is a popular flavour, just like your favourite liquor! Blue Cola Fizzy, refreshing and not too sweet. Enjoy the classic cola flavour without the calories! Caramel Toffee Smooth, creamy, buttery toffee with a sweet sticky caramel finish.